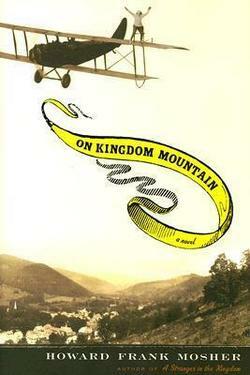 On Kingdom Mountain, set in Vermont in 1930, revolved around the character of Miss Jane Hubbell Kinneson, an incredibly eccentric mountain woman who carved birds, ran a bookstore, and was the last of her family to live on Kingdom Mountain. At first Miss Jane’s forthright nature can be a little annoying; she reminded me of Anne of Green Gables on steroids. Still, when she used her wits to deal with her cousin, Eben Kinneson, as they battled over the road he and the town fathers wanted to run over her mountain, I found myself rooting for Miss Jane. Intertwined with the battle over Kingdom Mountain was the story of Henry Satterfield, the rainmaking aviator and grandson of a thief who stole Civil War gold and supposedly hid it on Miss Jane’s mountain. A charming romance between Henry and Miss Jane ensued, and they worked together to solve the riddle of the missing gold, which was bound up in the mystery of her long lost uncle. Unfortunately, the biplane pilot’s heart was set toward finding the lost treasure more than it was on making Miss Jane his bride. My only complaint with the story was Miss Jane’s overwhelming lack of respect toward God. Her words and actions on that topic were rooted in arrogance and ignorance. Then again, if she didn’t agree with the writings of a secular author, she simply penciled out what they had written in a book. So, it probably shouldn’t have surprised me that she would do the same with a Bible. Her inflexible nature caused her a lot of heartache, yet she never seemed to learn from it. Many interesting peripheral characters were sprinkled throughout (the dog-cart man, Canvasback Glodgett, A Number One, and Sadie Blackberry) as well as rich history on the era and setting. Rooted in his own family history, Howard Frank Mosher has written an often hilarious, sometimes melancholy tale about a simple way of life up against the encroaching threat of modernization. Sounds like a good read. I’ll have to get that one form the library.